I provide sports massage therapy to professional and amateur athletes who participate in all types of sports and physical activities. Sports enthusiasts come to me individually for massage sessions or I also work with sport teams in the pre & post seasons to enhance & maintain an athlete`s preparation for optimal performance during training and competition. Whether you have an injury or are ready to be proactive & prevent the cumulative effects of physical activity with a maintenance program , my goal is to get and keep you performing at your best in your sport. Most bicycles on the market, including racing bikes, road bikes and mountain bikes force the body to constantly lean your weight forward. The forward-bent position may be slightly more efficient for riding speed, but places tremendous stress on the low back, neck, shoulders, elbows and especially the wrists. 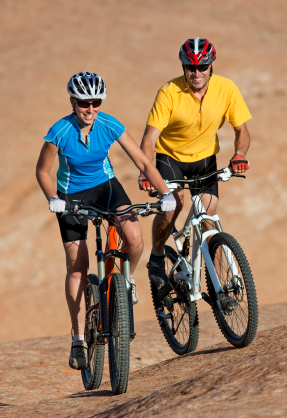 Many cycling injuries are associated with muscle imbalances that develop as a result of spending a lot of time pedaling and maintaining a hunched cycling posture. Often the cause of overuse injuries in repetitive-motion sports is technique errors. Because sports like cycling involve extreme repetition of a single movement, even a small deviation from correct form in that movement can result in a debilitating degree of tissue damage over time that can be alleviated by regular massage. If you are a cyclist, sports massage therapy will improve your joint flexibility leaving you pain-free, relaxed & back in the saddle ready to take on the road! Groin, low back and abdominal/core injuries make up a large portion of hockey injuries that sport massage therapists treat. The majority of these injuries are a result of either weak, or shortened muscles in the core area. The primary motions in skating are hip flexion (bringing the knee towards the chest), hip extension (extending the leg behind you) as well as external rotation through the low back and core. The “hockey muscles” are as follows: the iliopsoas and quadriceps muscles perform hip flexion and rotation, the gluteus maximus and hamstrings perform hip extension, and your abdominal muscles both stabilize and create the rotary movements. These motions are the primary motions in skating and thus a decreased range of motion or tension in any of these muscle groups can lead to pain, discomfort or injury. If you are a hockey player, regular sports massage will keep your muscles flexible & operating in their normal range, not only helping to ensure an injury free season, but also will improve your overall on ice performance. Golfers most commonly experience soreness around the head and neck (sprains as a result of tightening up and hitting too hard) and in between the shoulder blades due to. Your hands, forearms, and rotator cuff muscles are usually tense, contracted, or inflamed from gripping and swinging the club. Most golfers complain about lower back pain. The lower back or lumbar area is the fulcrum of your swing. The leverage in your swing is a function of this pivot point. This is used repetitively throughout the day on every swing. If a golfer continues to play with a sore back, they risk further injuries to surrounding muscle groups. This can result in chronic pain cycles, which interfere with their enjoyment of the game. How can golfers help prevent injury from their favorite sport? With sports massage! Whether for the athlete or weekend golfer, sports massage relaxes tension and relieves sore or stiff muscles. 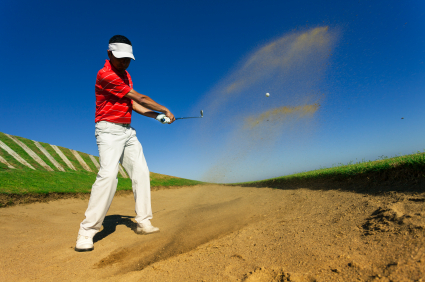 Golfers reduce their risk of injury if their muscles are flexible and mobile. Receiving specific attention to the muscle groups used in your golf swing can help you gain more power, distance and better endurance and most importantly, enjoy the game! 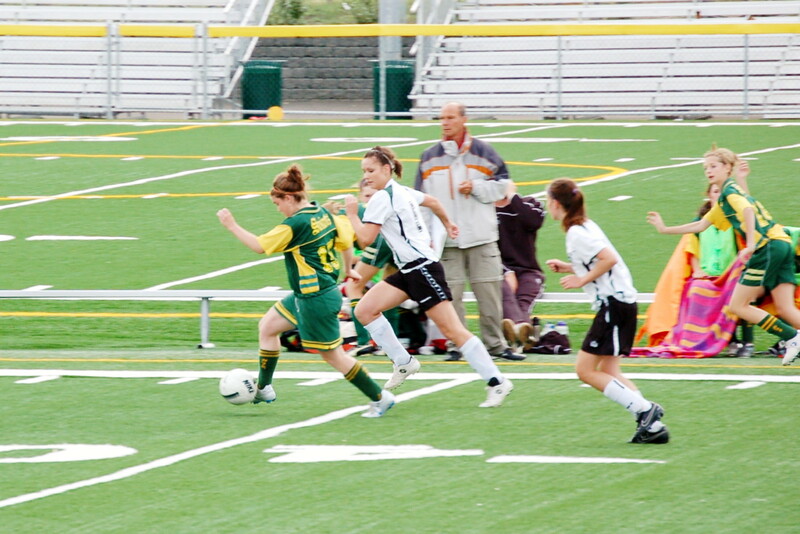 The potential for sprains & strains during a soccer game is common due to quick stop-start motions, pivoting and lateral movements and physical contact, including tackling, being tackled and collisions. Overuse soccer injuries usually occur over time & are caused by particular area of the body while acute injuries occur from a sudden blow to the body part & require immediate attention. The most affected areas are the head, ankles and knees. If you are a soccer player, there is no reason to be stiff and sore post-match, in fact you can reduce your risk of injury by receiving regular massage treatments. Sports massage for soccer players searches out the biomechanical stresses in your muscles, relieves them from stress and tension before they become a problem, enabling you to train harder and more consistently. Canadian football is one of the most demanding physical sports. It requires strength, speed, cardiovascular endurance, agility and the ability to withstand high impact collisions. 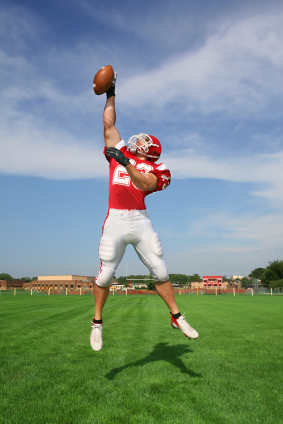 Because of the size and speed of the players engaged in this type of football, extreme collision forces can produce severe, even life-threatening injuries. There is not only a large demand on the joints in your body but also for your body to withstand the blunt force of impacts as well. The potential for injuries in football is so great, that a football player would be wise to have regular massage therapy sessions. If you are a football player, Sports Massage can become a part of your mental preparation in addition to treating and helping to prevent injuries. Most athletes have rituals or routines they do to prepare themselves for competition. Sports Massage benefits football players by helping them to relax and visualize success on the field. Decreased stress can equate to decreased mental mistakes on the field that can cost ball games. So massage benefits football players individually as well as the team they play for. Running is a sport of passion; why else would we torture our bodies with miles of punishment every day? Running injuries are an unfortunate, but all too common, occurrence. All runners can benefit from massage therapy, but it’s especially useful for marathoners and runners covering many miles in a week. Not only are their bodies subjected to a greater amount of stress, but also high-mileage runners tend to have an intense commitment to their training schedules–and don’t deviate from them. Some runners plow through runs and ignore aches and pains, and that can create problems down the road. Running has its challenges because it is a high impact sport. As an avid runner you have no doubt suffered with on-going aches & pains in your feet, legs & upper & lower back while pounding the pavement. Injuries often occur through repetitive movement & build over time. 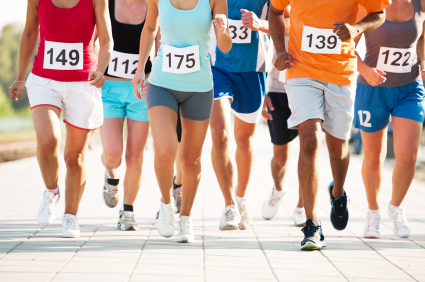 Runners commonly experience “runner’s knee”, hamstring pulls or shin splints which can keep you off the road. If you run, regular sports massage will improve your range of motion, keep your muscles flexible allowing you to train injury free & able to train year round. Tennis is a challenging sport for the body when you consider the amount of running players have to do. Add in the forceful, repetitive motions that players’ bodies must endure in order to master serves, volleys, forehands and backhands, and you have a sport that places a lot of stress on muscles, joints and ligaments. 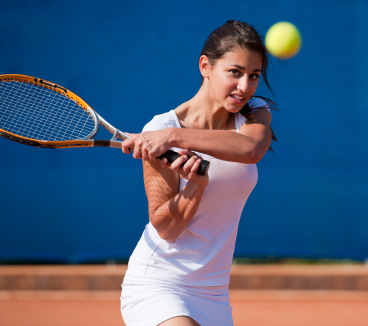 Being that tennis is a full body sport many players experience repeated stresses thru their neck & shoulders & forearms which can create chronic pain & tightness & setting yourself up for injury. What begins as a small, nagging ache or pain can quickly become a debilitating injury. The most common injuries associated with tennis are rotator cuff tendinitis, tennis elbow, wrist strains, back pain, anterior (front) knee pain involving the knee cap, calf and Achilles tendon injuries, ankle sprains. Sports massage can effectively treat tennis injuries, but more importantly prevent potential injuries by incorporating regular treatments to keep your muscles flexible & pain-free on and off the court. If you play tennis on regular basis, investing in regular sports massage therapy sessions is necessary to keep you injury free and ready for each match. If you are looking for a massage therapist to help you treat a sports injury, or to help keep your body in top shape for your sport, contact me and we’ll get started right away. Sports massage works! Whether you are a league player or a competitive curler from the delivery of 40 pound rock to the high intensity nature of sweeping and the long duration of games, curling places high physical demands on you. Knee, back and shoulder pain are experienced by curling participants, due to the sweeping motion, which involves repetitive upper limb movements, and the delivery position which requires sustained knee and low back flexion. We know that sweeping can be highly physically demanding and whilst not every stone will be swept with maximum intensity, the ability to recover quickly and sustain sweeping intensity throughout a game is a must. Knee complaints are most common due to the deep flexion & the weight-bearing over your sliding foot. Low back & shoulder injuries are due usually to sweeping & or lifting your rock during delivery. Maintaining muscle flexibility and range is essential to avoiding chronic pain which can lead to a season ending injury. A regular sports massage program in combination with proper conditioning program will keep you game ready & maximize your performance. If you are an athlete with an injury or a sports team manager looking for a massage therapist for your team, please contact me to book an appointment or find out more about how I work. DarleeAnn Mathieson is a registered massage therapist providing massage services to athletes and other physically active people. Darlee Ann’s focus is on rehabilitation, injury prevention and maintenance. Her massage office is in Blue Quill on the south side of Edmonton, Alberta. Copyright 2012, DarleeAnn Mathieson. All rights reserved. | Design by Dylan Stan.